When you plan to buy gold, do remember to carry your Permanent Account Number (PAN) card along, as you will have to furnish the same to the seller in case the transaction involves buying of gold coins or bars worth Rs 2 lakh or more. This vigilant step has come in from the Government to keep a check on the menace of black money. Also it is now mandatory on the part of the seller to collect tax at source on such sales. The buyer's identity - the PAN will be treated as the source of identity for this purpose, will be mandatory. Moreover, as per the norms for tax collected at source, the seller would be required to collect tax at a specified rate (from buyers) and deposit it with the Government. This is different from Tax Deducted at Source (TDS) where payment is made after deducting tax at specified rate. The Income-Tax Act clearly explains that getting PAN does not mean that one will have to pay tax. It is a tool to establish the financial identity. Similarly, if somebody is paying tax collected at source and his income is less than the threshold for tax, than he can claim refund only if he has PAN. This is the procedure for not just for traders but for any one. 1. Sale or purchase of any immovable property valued Rs 5 Lakh or above. 2. Sale or purchase of Motor Vehicles. 3. Any time Deposit (Eg: Fixed Deposit) exceeding Rs 50,000. 4. Contract of a value exceeding Rs 10 Lakh for sale or purchase of securities. 5. Making an application for installation of a Telephone connection. 6. Any one time payment to hotels or restaurants against their bills for an amount exceeding Rs 25,000. 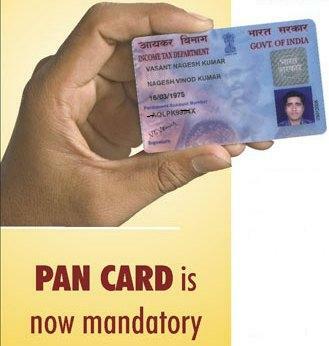 0 Response to "PAN card mandatory to buy gold worth Rs 2 Lakh or more"